Australians make around 50 million retail (typically low-value) payments per business day using cash, cheques, cards and the direct entry (DE) system (the latter includes direct debits and internet ‘pay anyone’ bank transfers). Obligations between financial institutions arising from cheque, card and DE payments settle on a deferred basis periodically throughout the day in aggregated batches in the Reserve Bank Information and Transfer System (RITS, Australia's real-time gross settlement (RTGS) system). The time required for institutions to process these types of payments, and for settlement to occur, means that there is a delay in the funds being made available to the recipient. This can take between a few hours and a day in the case of DE transactions, and can be as long as a few days for cheques. Weekends and public holidays can extend these timeframes. In February 2018, the NPP – a new payment system infrastructure designed primarily for retail payments – was launched to the public. The NPP enables consumers, businesses and Australian government agencies to make fast, versatile and data-rich payments 24 hours per day, every day of the year. NPP payments are settled finally and irrevocably between authorised deposit-taking institutions (ADIs) across accounts at the Reserve Bank in real time (that is, as they occur). This is made possible by the FSS, which was built by the Bank as a new service of RITS. The real-time settlement of NPP payments in central bank funds allows institutions to make funds available in recipients' accounts instantaneously without giving rise to settlement or credit risk. The NPP and FSS represent significant changes to the Australian payments system and are the result of a number of years of work by the payments industry and the Reserve Bank. This article sets out the background to the introduction of fast retail payments in Australia and the process of building the NPP and FSS. It explains the infrastructure and processes involved in making fast payments in Australia as well as the operating principles that enable quick settlement on a 24/7 basis. Finally, the article briefly explores some payment trends observed since the launch of the NPP and FSS. address (i.e. nominate the payee of) payments in a relatively simple way. The PSB encouraged the payments industry to determine the best way of addressing the strategic objectives, and endorsed a set of Core Criteria as the framework for assessing any industry proposal (RBA 2012b). In response to the PSB's strategic objectives, the industry under the auspices of the Australian Payments Clearing Association (APCA, now the Australian Payments Network) formed the Real-Time Payments Committee, which in February 2013 finalised an industry proposal to deliver a fast payments solution for Australia (APCA 2013). This was followed by the establishment of NPP Australia Limited (NPPA), with 13 members (12 ADIs and the Reserve Bank) working together to develop and run the NPP as an industry utility. The strategic review by the PSB and introduction of the NPP in Australia occurred in the context of significant developments in fast retail payment systems internationally. The PSB foresaw that, in the absence of collaborative efforts by the payments industry, the retail payment services offered in Australia were at risk of falling behind those available in other countries (Richards 2014). Although in some countries – including Japan, Korea, Mexico and Switzerland – fast payment capabilities for retail payments have existed for years, more recently technological advancements have led to numerous countries further developing their services or launching faster retail payments systems (Bolt, Emery and Harrigan (2014) and CPMI (2016)). The development of the NPP involved extensive cooperation between ADIs to build the capability to send and receive individual payment messages between themselves, as well as settlement instructions to the Reserve Bank's FSS, in real time. Additionally, the project required ADIs to upgrade their internal systems to allow posting to customer accounts within a few seconds. The enhanced capability of the NPP also meant that participating financial institutions initiated large internal projects to upgrade their payments processing and monitoring systems, as well as customer-facing internet banking systems and mobile device applications. Given the significant effort required both across and within ADIs, the NPP program took place over a number of phases. The first two phases began in June 2013 and focused on program planning, the development of business requirements, and sourcing of service providers. The third phase, which started in December 2014, involved the detailed design of the infrastructure along with the development of the operating procedures, industry test strategy and overall industry implementation plan. The fourth phase, which commenced in August 2015, involved the build and configuration of the core elements of the NPP infrastructure, including the NPP network, the switching capability (which co-ordinates and facilitates the movement of messages across the NPP network) and the addressing service. Following these phases, there was then a staged period of testing for both the new NPP infrastructure and ADIs' own internal system enhancements. The FSS was developed by the Reserve Bank in parallel with the NPP. The FSS enables final and irrevocable settlement of individual NPP transactions in real time. Leveraging the approach employed by some stock exchanges, the FSS employs in-memory processing to enable fast settlement-processing times, with a median settlement-processing time since launch of around 50 milliseconds. The design, build, testing and implementation of the FSS involved the cumulative efforts of Reserve Bank staff across multiple departments. As well as work related to the payment system infrastructure, changes needed to be implemented to support the introduction of 24/7 shift work (as the functioning of the FSS is monitored continuously) and to upgrade general building infrastructure to support continuous system operations. The Bank worked with participant institutions to enable appropriate liquidity mechanisms to facilitate settlement of the anticipated transaction values in the FSS overnight and on weekends when the cash market is closed. As well as providing the FSS, the Reserve Bank also engaged in a separate project in its Banking Department – which provides transactional banking services to a number of government agencies – to construct the infrastructure and systems required to support its role as an NPP participant. The Bank's participation in the NPP enables government agencies to provide enhanced payments services to their customers, such as for emergency benefit payments made by the Department of Human Services. The NPP and FSS went live for use between participant institutions on 27 November 2017. At this time, there was a period of ‘live proving’ where a small number of real transactions were processed to verify participants' various end-to-end payments-related systems and processes in a production environment. Following this final live-proving phase, the NPP was officially launched to the public on 13 February 2018, making fast payment services available to customers of around 50 participating financial institutions on the day of launch. The introduction of real-time payments in Australia was enabled through the development of two new payments system infrastructures – the NPP Basic Infrastructure and the FSS. This section outlines the key components and architecture of the NPP and FSS, as illustrated in Figure 1. The NPP Basic Infrastructure is the industry utility owned and operated by NPPA, which provides the core capabilities required for fast and flexible payment messaging. It uses the ISO 20022 international messaging standard, which is a global standard for financial messaging that is flexible and extensible, and therefore enables the sending of richer and more complete remittance information with a payment. the addressing service, which enables customers, through their financial institution, to link their transaction account to a simple unique identifier called a PayID, such as an email address, phone number or ABN. This service provides confirmation of the payee's legal account name when a PayID is entered, which reduces the risk of misdirecting a payment compared with using a BSB and account number to address a payment. The FSS is a service of RITS, developed and operated by the Reserve Bank, which supports the settlement of NPP payments between ADIs 24/7. It does this by providing fast, high-volume settlement of individual NPP settlement requests received from the NPP Basic Infrastructure across the ESAs of the ADIs. The payment message format for the FSS is ISO 20022. When a settlement request for a payment is received, the FSS tests the payment against technical criteria and for funds availability in the relevant ESA. If this testing is successful, settlement will occur irrevocably and unconditionally in real time. An advantage of real-time settlement in the FSS is that it eliminates credit risk since payments are settled with finality immediately, allowing ADIs to make funds available to their customers without generating credit risks and removing the need for other controls, such as caps on exposures. ‘Overlay services’ are commercial payment services that use the NPP Basic Infrastructure's capabilities to send payment messages quickly, address payments using PayIDs and send detailed information with payments. The overlay services framework allows for competition and innovation in the provision of payment services. Overlay services can range from simple arrangements that involve setting industry standards or more complex payment solutions that implement new message flows or payment types between participants. The framework also allows overlay services to be offered without all participants joining, which means that they can be launched more quickly and that there is the potential for a variety of industry-wide or more specialised payment solutions to be developed. The first overlay service, Osko by BPAY, is a payment option available via participating ADIs' digital banking channels on a 24/7 basis that enables funds and information to be rapidly transferred and made available to recipients. This service can be used by a range of third parties such as corporates and fintechs to send and receive payments and supporting data in real time. The capabilities of this overlay may also be used as a component of new overlays designed for the needs of particular customer segments. How are NPP payments processed? A customer (the payer) initiates a payment through a banking channel such as an on-line banking portal or mobile phone banking application. If the payer has chosen to use a PayID to identify the recipient of the funds, the payer's institution will send an enquiry message to the addressing service to find the payee's BSB and account number linked to the PayID. The legal account name associated with the PayID is returned to the payer for confirmation, which will help to reduce the occurrence of misdirected payments and fraud. The payer institution then sends a message with all the relevant payment details, subject to any overlay service requirements, to the payee's institution using its payment gateway. The payee's institution clears the payment by checking the payment details and sends a response back to the payer's institution via its payment gateway, confirming it is able to credit the payee. With clearing of the payment complete, the payer institution's payment gateway automatically initiates settlement by sending a settlement request to the FSS, which tests that the payer institution has sufficient credit funds, and then transfers value between the two institutions' ESAs in real time by simultaneously debiting the ESA of the payer institution and crediting the ESA of the payee institution. The FSS then returns a settlement confirmation to both institutions indicating that settlement has occurred. Once the settlement confirmation has been received, the payee ADI makes the funds available to its payee customer. How are NPP payments settled by the FSS? Individual NPP payments are settled with finality by simultaneously crediting and debiting ESAs held at the Reserve Bank. 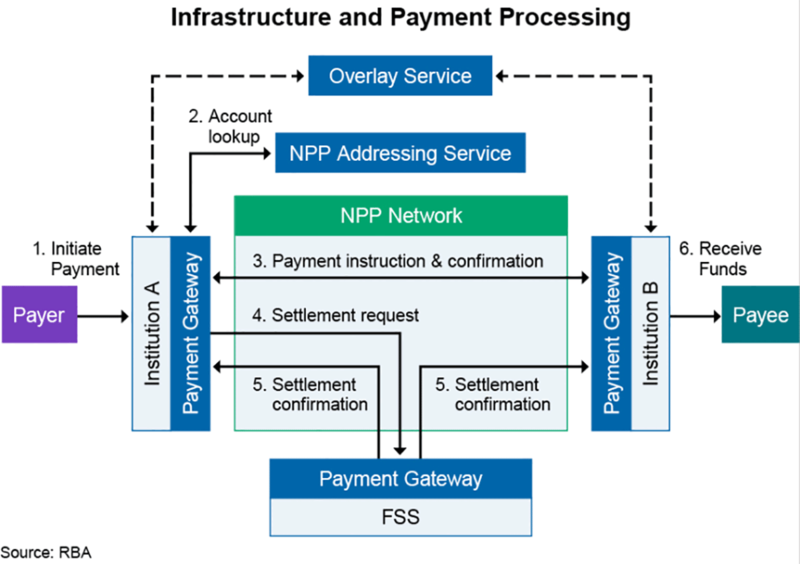 Although the FSS uses some of the existing RITS infrastructure (such as the user interface), NPP payments are settled by the FSS independent of other types of payments submitted to RITS (which are settled by the RITS System Queue). While RITS members use a single ESA to settle payments, institutions divide their ESA funds between an FSS Allocation and a RITS Allocation. NPP payments are settled using funds available in the FSS Allocation only. If testing is successful, settlement occurs. The payee institution's FSS Allocation is credited simultaneously with the debiting of the payer institution's FSS Allocation and a settlement confirmation is sent to both institutions. If a settlement request fails, due to insufficient funds or any other validation error, the NPP payment is rejected, settlement is not completed and a rejection message is returned to the institutions. In order to process and settle payments quickly, it is also not possible to recall NPP payments, since the FSS settles or rejects payments very quickly. Institutions are encouraged to ensure that they always maintain sufficient funds in the FSS for the settlement of NPP payments. The Reserve Bank assists institutions with their liquidity management through the automated system liquidity management tools in RITS (including the FSS) and eligible institutions are able to access funding through the Reserve Bank's Standing Facilities. With the introduction of the FSS, a new liquidity management tool was built into RITS. Through this tool, institutions are able to adjust the amount of funds available in the FSS and RITS Allocations of their ESA by setting upper and lower ‘trigger points’ on their FSS Allocation (Figure 2). 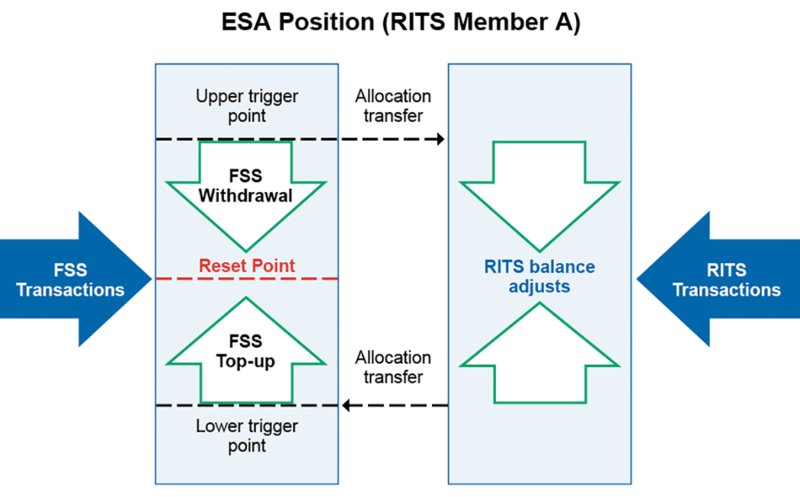 When a trigger point is reached, funds are automatically reallocated between the two Allocations of the ESA to a ‘reset point’ set by the institution. Institutions are also able to manually request that their FSS Allocation is returned to their nominated reset point. The use of upper and lower trigger points to automatically top up or withdraw funds in the FSS Allocation helps ensure that funds are available for both NPP and RITS transactions. However, RITS settlement hours are between 7.30 am and 10 pm on business days, while the FSS settles NPP transactions 24/7, so all ESA funds are transferred to the FSS Allocation when RITS is not operating. The Reserve Bank's existing Standing Facilities, which are available to eligible institutions, can also be used to assist with liquidity management, by making additional ESA funds available on pre-specified terms. The Bank offers intraday repurchase agreements (repos), which carry no interest charge but must be reversed later that day, to help institutions manage their outgoing and incoming payment flows through their ESA. The Bank also provides ‘open’ repos to institutions that would otherwise regularly require intraday repos and institutions that settle DE or FSS payments at times when the cash market is closed (that is, overnight or on weekends). These open repos do not have a fixed maturity date. The NPP has been designed to provide a number of ways for entities to leverage the NPP's functionality. ADIs can participate in the NPP by becoming either an ‘NPP participant’ to directly clear and/or settle NPP payments or an ‘identified institution’ by forming an agency arrangement with a ‘sponsor participant’, who clears and/or settles the NPP payments on their behalf. There are already more than 55 banks, credit unions and building societies that are able to offer fast payments to their customers via agency arrangements through ADIs specialising in providing such services. These organisations or NPP participants who provide institutional banking services can also provide access to third parties other than ADIs, such as fintechs or corporates. NPP participants can choose to connect to the NPP Basic Infrastructure by either installing their own payment gateway, arranging to use another NPP participant's payment gateway, or using a third-party payment gateway provider. In future, other classes of organisations without ADI licences called ‘Connected Institutions’, which otherwise satisfy the required criteria, could obtain their own payment gateway and submit non-value messages such as payment initiation messages that are processed by NPP participants. The NPP and FSS have been designed to meet the demands of real-time payments and continuous operations, including high standards in relation to availability, capacity and security. The Reserve Bank is targeting an availability of 99.995 per cent for the FSS. To support 24/7 operation of the FSS, the Bank extended the operating hours of the RITS Help Desk to 24/7. The FSS is monitored continuously so that any system problems can be promptly identified and managed. The FSS is designed to allow planned maintenance and upgrades to be carried out while the system remains in operation through the use of isolated components that can be upgraded independently. The FSS can also be operated from two geographically remote sites, which is required to meet very high levels of availability. In the event of a more extreme disruption to the FSS, the NPP has contingency arrangements in place such that the NPP Basic Infrastructure can continue clearing payments for up to 12 hours without settlement, storing settlement requests until the FSS is available again. For the Australian payments system as a whole, the NPP will contribute to improved resilience by providing a new means of making retail payments. Further, since it is an RTGS system, the NPP can, if required, be used as an alternative to the traditional methods of making wholesale interbank payments through RITS. The NPP and FSS also change the risk profile faced by participants in the Australian payments system, by reducing the likelihood of delays in receiving funds but increasing the importance of real-time behaviour monitoring as there is no delay for the recipient of a fraudulent payment to access the proceeds. For further information about the resilience features of the NPP and FSS, as well as the risks and associated risk mitigants for NPP payments, refer to Box D: The New Payments Platform and Fast Settlement Service of the Bank's April 2018 Financial Stability Review. Since the public launch of the NPP involving around 50 institutions in February 2018, more than 65 banks, credit unions, building societies and other ADIs have rolled out services to their customers. In the initial weeks after launch, payment volumes were constrained to allow participating institutions to fine-tune their systems and operational processes. ADIs have also taken a staged approach in their roll-out strategy, gradually introducing services, channels and customer segments such as business and corporate customers. Reflecting these staged roll-out strategies, initial adoption of the NPP by customers has been gradual. It is also expected that it will take time for customers to evaluate the NPP capabilities offered by ADIs and modify their payment habits. Nonetheless, there has been sustained momentum: registration of PayIDs has been steadily increasing – especially as ADIs have opened up services to additional groups of their consumer, business and government customers – with over 1.9 million registrations as at the end of August. Likewise, use of the NPP has continued to rise since its public launch, with the FSS having settled a total of 19.4 million interbank transactions amounting to $15.1 billion as at the end of August (Graph 1); intrabank NPP transactions and transactions made between Identified Institutions that use the same Sponsor are not routed through the FSS. The daily value and volume of settlements through the FSS is in line with expected weekday variations, with a mid week peak and a weekend trough (Graph 2). For example, there is a peak in transactions on Wednesday and Thursday, which may be the result of consumers making more NPP payments on days they receive their salaries. Differences in consumer and business payment behaviour may also be influencing the intraday FSS settlement patterns (Graph 3). The value of FSS settlements is elevated on business days between 9 am to 5 pm, reflecting the higher values involved in business-related transactions, whereas the peak volume of payments is spread more widely through the day until around 9 pm, with evening payments presumably mostly reflecting consumers making lower-value payments. The uptick in values early in the morning represents some payments that have been instructed by customers days in advance, and scheduled by ADIs to occur at times when customers are less likely to be making high volumes of immediate payments. These patterns will likely become clearer when there is significantly more volume of payments going through the FSS as use increases and a broader range of customer channels and segments are using the NPP. The NPP and FSS represent a significant development in the Australian payment system, with customers of financial institutions now having the ability to make immediate payments on a 24/7 basis with more easily remembered PayIDs. With the capacity to send detailed information along with these fast payments, the NPP has been designed to meet the needs of Australia's digital economy and has the potential to promote further innovation and competition in payments services in the years to come. APCA (2013), ‘Real-Time Payments Committee Proposed Way Forward’, 8 February. Available at <http://apca.com.au/docs/real-time-payments/real-time-payments-proposal.pdf>. ASX (2018), ‘CHESS Replacement: New Scope and Implementation Plan’, April. Available at <https://www.asx.com.au/documents/public-consultations/chess-replacement-new-scope-and-implementation-plan.pdf>. Bolt S, D Emery and P Harrigan (2014), ‘Fast Retail Payment Systems’, RBA Bulletin, December, pp 43–51. CPMI (2016), ‘Fast Payments – Enhancing the Speed and Availability of Retail Payments’, November. Available at <https://www.bis.org/cpmi/publ/d154.pdf>. Hing A, G Kelly and D Olivan (2016), ‘The Cash Market’, RBA Bulletin, December, pp 33–42. KPMG and CBA (2018), ‘The NPP and Superannuation: A revolution in efficiency’, 28 February. Available at <https://assets.kpmg.com/content/dam/kpmg/au/pdf/2018/npp-and-superannuation-kpmg-cba.pdf>. RBA (2012a), ‘Strategic Review of Innovation in the Payments System: Conclusions’, June. Available at <http://www.rba.gov.au/payments-and-infrastructure/payments-system-regulation/past-regulatory-reviews/strategic-review-of-innovation-in-the-payments-system/conclusions/>. RBA (2012b), ‘RBA Core Criteria for a ‘Fast Payments’ Solution’, Strategic Review of Innovation in the Payments System, November. Richards T (2014), ‘The Path to Innovation in Payments Infrastructure in Australia’, Speech at the Chicago Payments Symposium, Chicago, 26 September.